AppleInsider strapped on Apple's latest band to our new Apple Watch to take them for a spin. From a physical standpoint, nothing has changed compared to the silver or Space Black versions. It is still made of stainless steel, woven on custom Italian machines. The clasp has a perfectly tuned magnet that holds its place but is easy to remove at the end of the day. A small silicone ring helps keep its spot during the day and prevents any metal-on-metal scratches. The ends of the lugs are a polished stainless steel, while the front is more matte. Apple Watch Series 4 comes in gold aluminum and gold stainless steel, and this is clearly designed for the stainless model. If attached to the aluminum model, it will look great, but there will be the subtle differentiation between the two finishes. It most likely won't be noticed when worn, other than perhaps by the wearer. We've worn Apple's Milanese Loop bands for many years, and they are some of the most comfortable around. They can be infinitely adjusted for the exact fit, and the movement of the mesh makes them far more comfortable than other, stiffer, bands. The only downsides to a loop-style band are the limitations when it comes to docks. It can't lay flat on a dock, and instead must have access for the remainder of the band to wrap around behind the charger. One of the biggest hurdles for potential purchasers will be the price, especially when comparing to cheap options on Amazon. But, when compared side-to-side, there is a stark difference. Amazon models typically have a looser weave, aluminum lugs, non-matching finishes, and a higher likelihood of the finish scratching off and losing its color and luster. The difference between a cheap clone and Apple's version can be felt immediately when holding the two models in your hands. Apple's Gold Milanese Loop comes in 40mm and 44mm sizes - though it will fit the 38mm and 42mm models as well. It can be picked up now from Best Buy for $149.99 in either size. In the photo ,the Milanese loop is upside down. “The only downsides to a loop-style band are the limitations when it comes to docks. It can't lay flat on a dock, and instead must have access for the remainder of the band to wrap around behind the charger.” Check again. You can pull the magnetized end of the strap all the way out of the loop (attached to the Watch). Then, the Watch will lay flat, with the entire band (minus the solo loop) all on one side of the charger. you wrote that there“s no physical change. But I‘ve noticed a big one with my silver stainless steel. The ‚clasp‘ can now get loose and if you’re not careful the watch might fall down if you’re not aware. That means that the end of the clasp can now be removed from the watch! Do you mean that on your band, the magnetic end fits through the slot? I don't think that is supposed to happen. Unless they have changed something I have found that not to be true at least on the original silver SS band. Just flexing your wrist will cause it to loosen. I found myself retightening it many, many times during the day. But it is not a problem anymore since I don't use the Apple watch now, because it kept breaking, meaning the whole watch would just fall out of the case for no reason, no mistreatment, just hanging by the ribbon cable. Happened twice so I went back to a heavy duty classic chronometer style diving watch with solar power, which is working out great. It still connects to an iPhone to synchronize the date/time and timezone. The solar power is fantastic. No charging necessary, just wearing it during the day is sufficient to keep it charged 24 hours. I hardly ever used the apps on the Apple Watch anyway so I don't miss any of the functionality. I do see a lot of people wearing Apple Watches these days though. Been lusting for the Gold Stainless Steel model since seeing one at the Apple Store this last Monday. Birthday in November and then there is Christmas. Don't know if I'm going to be to hold out that long. Be forewarned that Apple's black Milanese loop has a high-quality DLC (diamond-like coating) that can scratch almost any surface. And you think your experience is indicative of the entire product? That’s complete baloney. I also purchased a series 0 SS with Milanese band and am still wearing it to this day. No problems with the band needing retightening, no problems with it falling apart constantly, no battery problems, just a quality product that works. I was so ready to get the gold series 4 with the Milanese loop, until I saw it in the store. It's not the color I expected from the photos and marketing images. A bit too copper-y for my taste. You are flat out wrong. I have a series 0 SS with Milanese loop band and it does NOT pull through the anchor attached to the watch. No way, no how. I never said it was indicative of the entire product line. I said "I have found..." My personal experience. As far as falling apart I'm pretty sure it is a very uncommon problem. I did find two posts on the Internet where it happened to others. In my case the first time it happened it was still on Apple Care+ but the second time it was out of warranty and it would cost $249 to fix, which I declined. I found it interesting that both the Milanese Loop, and the SS Bracelet had significant price cuts after the Series 4 launch. Almost affordable (although the bracelet still costs more than my actual non-Apple watch, and about 2/3rds of my Series 3 Apple watch, which was cheaper last year than the Series 4 is this year). AppleInsider, could you double check the claims above about the band pulling through the anchor? I've read a number of commends on Reddit that suggested that something changed with the series 4 bands that have allowed that to pull through. This was NOT the case with the original Milanese Loop SS bands, either silver or black, so I don't believe historical data is relevant here. 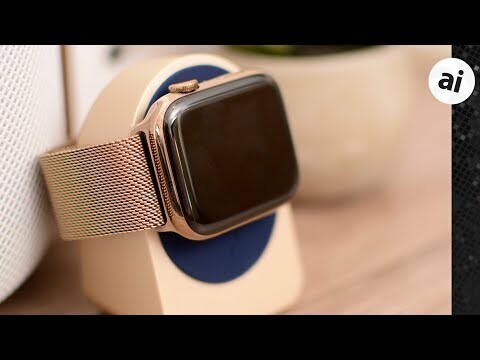 I'd like to find out from someone with a Gold Milanese Loop if it is possible to pull the band through. Is this band actually gold-plated? If not, then it's a ripoff. I've been wearing an aftermarket gold-colored Milanese loop with my gold aluminum Series 1 and it's still going strong and looks great. It cost me about $15. It's on my gold aluminum Series 4 now and looks even better with the deeper gold anodizing of the watch. I'd dare anyone to see a significant difference in quality. I just looked. I was wondering if the bracket was still being made as it doesn’t seem to be offered with the watch anymore. I first got mine (DLC) with my series 2. Using on my series 3, and will be again when my series 4 gets here in a few days. they lowered it by a lot. The SS finish is now just $349, down from $499, and the DLC is $449, down from $549. It’s interesting that the DLC used to be $50 more, and now, with the lowered price being $100 less than it used to be, it’s $100 more than the natural finish version is now. DLC finishes are expensive. i hope this doesn’t mean it’s being discontinued. If so, it explains why it isn’t coming in a PVD gold finish too. I hope not. Yes, you can spend $150 on that band if that floats your boat. But I have seen black Milanese Loop bands sold on Amazon for $9.00, that held just fine over a year of daily heavy-wear, with absolutely NO signs of any clasp problems or 'fading' of the color or texture. Nine..... Dollars..... Slips in and lines up perfectly into the band-holders. Even the magnet is still going strong. +1, SS AW0 here that has never had any issues with falling apart. The cheap bands in that price range I got on Amazon were chinese junk. For leather, anyway. I bought a second Apple brand classic leather buckle band since they discontinued it. Wanted a third party but none of them looked just to me. I’m sticking with my black stainless steel band.